As a way to educate the next generation of STEM students, Virginia Space Grant Consortium and its partners, Hampton University and Thomas Nelson Community College, are offering an exciting, free, online Virginia Earth System Science Scholars (VESSS) four-credit course to high school juniors and seniors in Virginia. This transferable, four-credit, dual enrollment course engages students in real world investigations of the Earth by working with the latest NASA data and research from satellite and airborne missions. Students will understand that the Earth is a system and its response to natural and anthropogenic factors will have an effect on humans through changes in the climate. Students explore all science disciplines while cultivating 21st Century Learning Skills such as critical thinking, data analysis, and inquiry-based problem solving as well as learn soft skills such as communication, collaboration and adaptability. Students learn about topics such as the Earth’s surface and interior, atmospheric composition, weather, water energy cycles, and climate variability while emphasizing the concept that all systems have their unique identities, and there is substantial interaction between them. This course is offered from December through April. Successful completion of the course will allow students to earn four college credits from Thomas Nelson Community College (TNCC) in Geology 195. 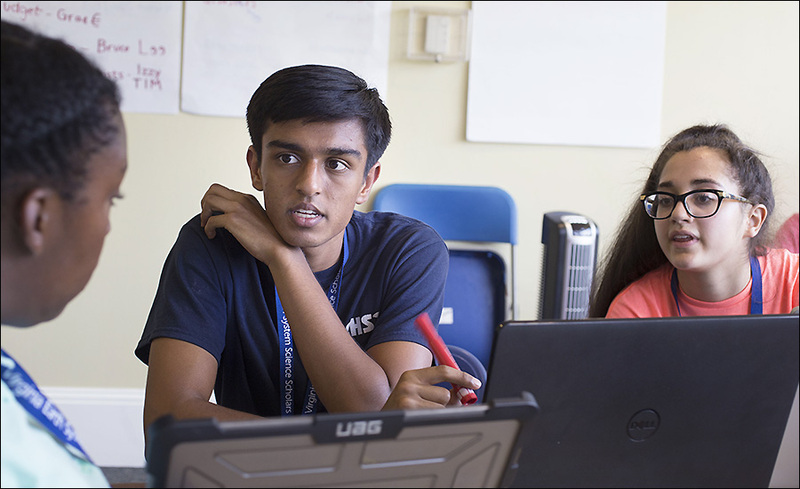 Students who perform well in the course are invited to participate in the one-week residential summer academy at NASA Langley, where an additional 1-credit in GOL 199 Independent Research can be earned. Scholars work under the mentorship of NASA scientists to examine state of the art, research and knowledge on issues such as tracking atmospheric precipitation, climate zone hot spots, studying sea level changes and analyzing effects of ground subsidence.